I felt that I spent a long time bashing Into Darkness with my last post and wanted to do some good for the movie. So I whipped up a little Photoshoppery and fixed this picture. 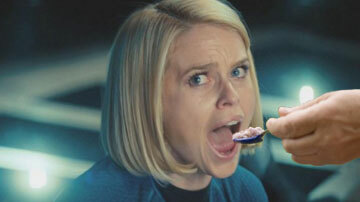 I imagine Carol Marcus' father, the devious Admiral Marcus spoon feeding her to calm her down. Complete with tiny Enterprise noises. "Open the shuttle bay- ppbbbrbrbrlbelbrrbebrlrrrrrr..."